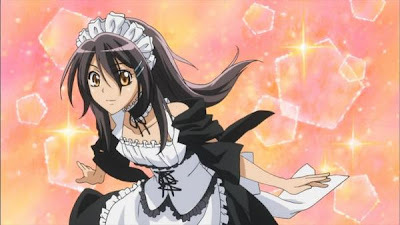 With the title including the word "maid", I initially dismissed this as a guy's anime. In fact, Sak actually started watching it with me, also thinking this to be the case. But nope, it's shoujo. (source) You can see how one might get confused. The premise - smart girl secretly moonlights as a maid for money, gets found out by boy classmate. Eventually love blossoms from the mutual shared secret. (source) "EEE! Don't tell anyone!" An on-the-surface-jerk-guy who has a hidden weakness for the heroine is a common character type in shoujo, and I like the bad guy as much as the next girl. 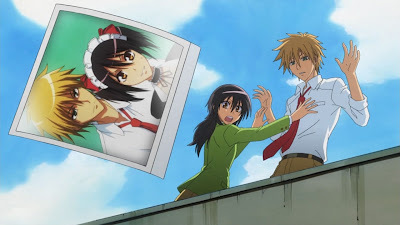 What sets this anime aside I think, is that Usui realizes he's in love much sooner than Misaki, the girl, does. Misaki is a very strong female lead. She's a tough cookie, working hard in school and on the job. I found her very likeable. Usui was a little more stereotypical, though he has some good facial expressions/moments. It's a cute anime, though it doesn't go very deep, and in some frames the drawings seem a little off. I have a feeling that the manga would be much better in terms of character depth. The best part of the show, in my opinion, is the super cute maid outfits! I love the sleeves, I wonder how they are made? I watch part of this. I kept thinking Boys over Flowers.